The greatest Neo-Babylonian King was undoubtedly Nebuchadnezzar II. 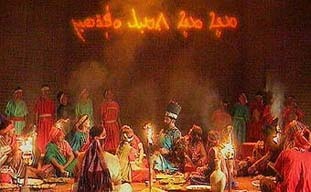 He was the oldest son of Nabopolassar, the Chaldean conqueror of the Assyrians and restorer of Babylonian independence. He reigned for forty three years (c.605-562 BC) and amassed a large empire in Mesopotamia. He was a very devout ruler (the Babylonian god Marduk was his chief deity) and he treated his captives humanely, unlike the cold blooded Assyrians. Many of the Jews that he exiled from Jerusalem were assimilated into the Babylonian culture and some rose to positions of relative power in the Court. The annals speak not so much of his military conquests but about his remarkable building programs. 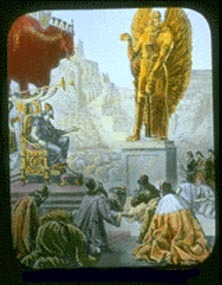 Nebuchadnezzar, in his conceit, had a golden statue erected of himself as a god on the Plains of Dura. Accoring to the Bible [Book of Daniel (iv)] God punished Nebuchadnezar because of his insufferable pride by causing him to become mad and live in the fields like a wild animal. However, it is generally accepted that this affliction was suffered by his eventual successor, Nabonidus. 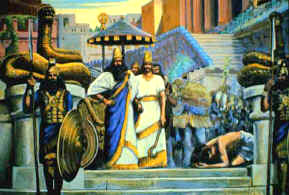 Nebuchadnezzar died in Babylon between the second and sixth month of the forty third year of his reign. The succession after the death of Nebuchadnezzar in 562 BC was a muddled affair. His son, Amel-Marduk (called evil Merodach in the Bible) ruled for only two years from 561 to 560 BC and was succeeded by his brother-in-law, Nergal-shaw-usur (Neriglissar) in 559 BC. He had married a daughter of Nebuchadnezzar and had been present at the destruction of Jerusalem. He ruled for three years (559-556 BC) and was succeeded by his young son, Labashi-Marduk, who was murdered in June 556 BC after only two months on the throne. 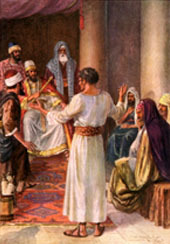 The conspirators then selected a commoner called Nabonidus to be King of Babylon. Nabonidus appears to have been mentally unstable. He went into a self imposed exile in the Oasis of Tema in the Arabian desert and was absent from the city of Babylon for a period of seven to ten years. He made his oldest son, Belshazzar, the co-regent of Babylon and put him in charge of his officials and army. Nabonidus ignored the god Marduk and during his absence from Babylon he failed to observe the important religious new year festivals. He attempted to restore the primacy of a religion based on the worship of the moon god Sin and thus became very unpopular with the priests and court of Babylon. 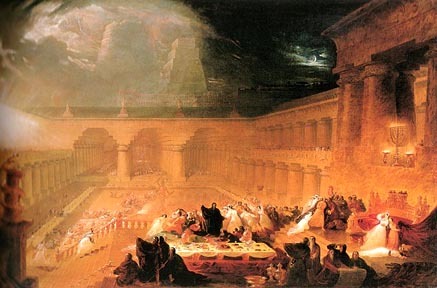 According to the Bible (Daniel 5:1-4) and confirmed by the Greek historian, Herodotus, in October of 539 BC, Belshazzar hosted a great feast inside Babylon, wining and dining a thousand exalted guests. "MENE, MENE, TEKEL PERES UPHARSIN"
Greatly alarmed, Belshazzar called upon all the priests and wise men of Babylon to decipher the meaning of the inscription but they were unable to do so. At the suggestion of his wife, Nitocris, he summoned the Prophet Daniel and asked that he interpret the message for him. Mene: God hath numbered thy kingdom and finished it. Tekel: Thou art weighed in the balance and found wanting. Peres, Upharsin: Thy kingdom is devided and given to the Medes and Persians. Before the great feast, Cyrus' army had engaged the Babylonian army outside of the city's walls and routed them. The Babylonians withdrew within the city's "impregnable" walls, made light of Cyrus' seige and continued their feast. 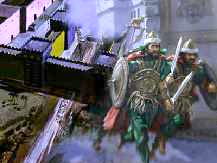 However, Cyrus' army, led by his general, Gobryas, diverted the waters of the Euphrates, waded under the city's walls and entered Babylon without opposition. They were welcomed by the Babylonian citizens who detested Nabonidus and Belshazzar. Nabonidus returned to Babylon after it was occupied by the Persians and he and his son, Belshazzar, were slain by the Persian army. 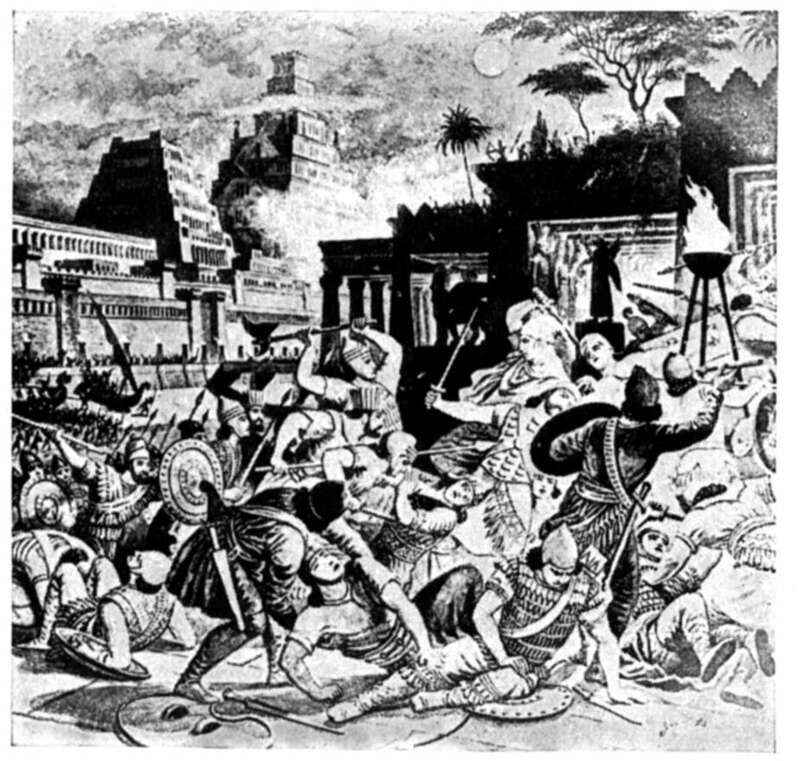 Fourteen days after his army had "captured" Babylon (October 30, 539 BC) Cyrus entered the city. He was welcomed as a hero and liberator and green twigs were spread in front of him and a state of peace was imposed upon the city. According to the cuneiform on Cyrus' cylinder, he was favored by Marduk and the other gods who wanted Nabonidus and Belshazzar dethroned and who assisted him in his quest. He reestablished their religious practices and was a very benevolentt and liberal ruler. He was responsible for the return of the Jews to Jerusalem and the rebuilding of their temple. 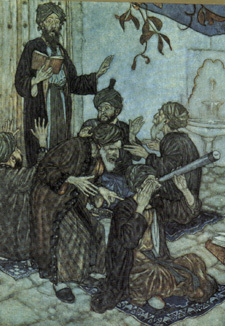 Cyrus founded the city of Parsargade which was once the capital of Persia. He died in 330 BC. Two hundred years later, in 529 BC, Alexander the Great came upon Cyrus's tomb while campaigning in Persia. He admired Cyrus as a great empire builder and ordered that the ransacked tomb be refurbished. Ancient historians claim that there was an inscription on the tomb which was roughly translated as "I am Cyrus, who founded the empire of the Persians. Grudge me not therefore, this little earth that covers my body." The reign of the Persians in Mesopotamia and beyond lasted for more than two hundred years until the arrival of Alexander the Great of Greece...but that is another story. Bibliography: Cyrus takes Babylon, Jona Lendering;cd Universe; The Bible Gateway; The Catholic Encyclopedia; Mesopotamia and the Ancient Near East, Michael Roaf.